Babblings of a Mommy: Delicious Lindt Lindor Truffles For The Holidays. 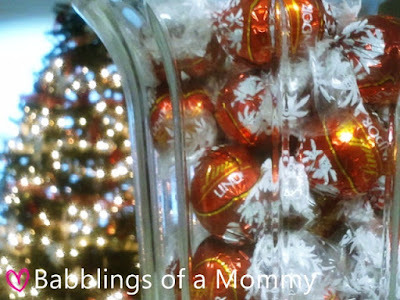 Delicious Lindt Lindor Truffles For The Holidays. One of my favorite things about the holidays is the ability to bring families together. Whether it's in-town or out of state, families get together to spend the next few weeks with their loved ones, enjoying each others company and creating special moments. Perfect for a stocking stuffer, gift for the chocolate lover, or even simply sharing them with friends and family like I did--these delightful treats offer up plenty of uses for the holidays. Nothing tastes quite like the Lindor Truffle. Created only by Lindt’s Master Chocolatiers, it’s exquisite chocolate filled with a smooth chocolate center. When the irresistible center starts to melt...so will you. Smooth. Flowing. Luscious. Chocolate like no other. Disclosure: Compensation was provided by Lindt via Glam Media. The opinions expressed herein are those of the author and are not indicative of the opinions or positions of Lindt.